1 of 6 Place chicken, marrow bones, carrots, parsnips, turnips, parsley roots, green pepper, onion and 1 tbsp of the salt in a 12-quart stockpot. Cover with 6 quarts cold water and bring to a boil over high heat. Skim and discard foam that forms at the top when it comes to a boil. 2 of 6 Add remaining 2 tbsp salt, the parsley, cauliflower, garlic, peppercorns and allspice and return to a boil. Simmer, covered, over low heat for 1 hour. Remove the 4 chicken breasts and allow them to cool slightly. Remove meat from bones. Shred or chop meat and store it in fridge to serve in soup or for another use. Return bones to pot. Continue simmering, covered, over low heat, for at least 2 hours more. 3 of 6 Strain entire contents of pot through a colander lined with cheesecloth or a clean old T-shirt. Discard all solids or save them for another use. Chill broth overnight. 4 of 6 To serve soup, remove surface fat and pour broth into a large pot. Bring to a simmer over low heat and cook until warm, 10 to 15 minutes. Add zucchini, carrot, daikon and, if desired, reserved chicken. Simmer 5 minutes to cook vegetables and heat chicken. Be careful to keep soup over low heat; bringing soup to a boil can make it cloudy. Season to taste with salt. 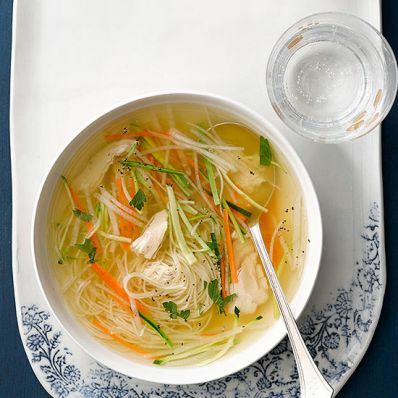 5 of 6 Place 1/4 cup Passover noodles in each soup bowl and ladle hot soup over pasta. Serve immediately. 6 of 6 This soup can be frozen after surface fat is removed. You can freeze breast meat separately if you want to use it for other dishes.